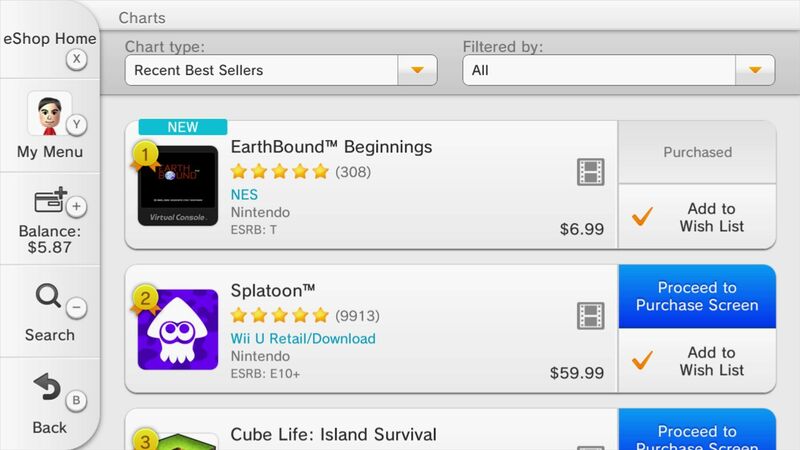 I shared this on last night’s Earthbound Central Live stream, but here it is again: EarthBound Beginnings has reached #1 on the Wii U’s recent sales rankings! It almost feels surreal to see a two decade-old, previously-unreleased NES game dethroning a completely brand-new Nintendo IP. Is this real life? Thanks to everyone who’s shared this info with me or elsewhere online, and thanks to Sam for sending me the EU photo! Currently the UK it’s still #2 to Splatoon, but I’ll check it again later. I do like how it’s gotten so popular. I don’t think the shop takes into account disc versions of games – I would imagine more people own Splatoon overall than own Earthbound Beginnings if you include people with the physical disc. 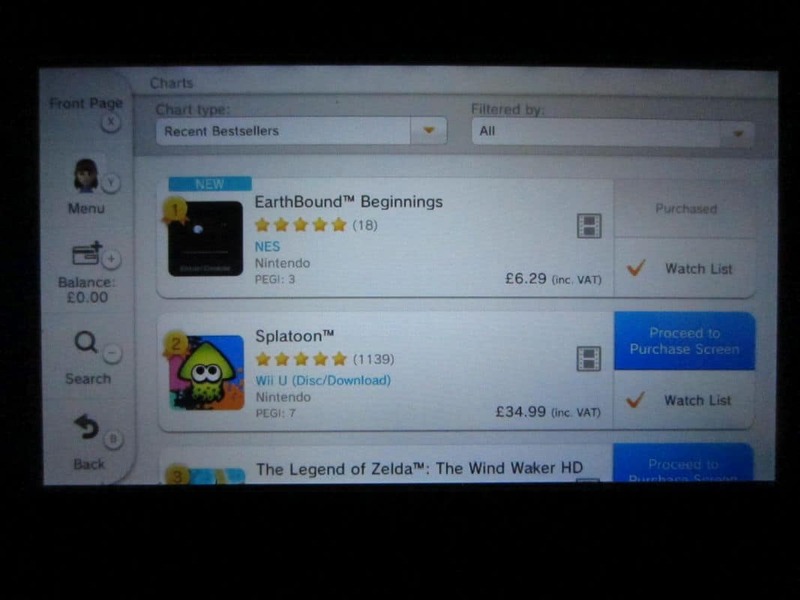 But still, Earthbound BEginnings overtaking the digital version of Splatoon is pretty cool as well! Just in case people haven’t played it yet, Splatoon is legit good. 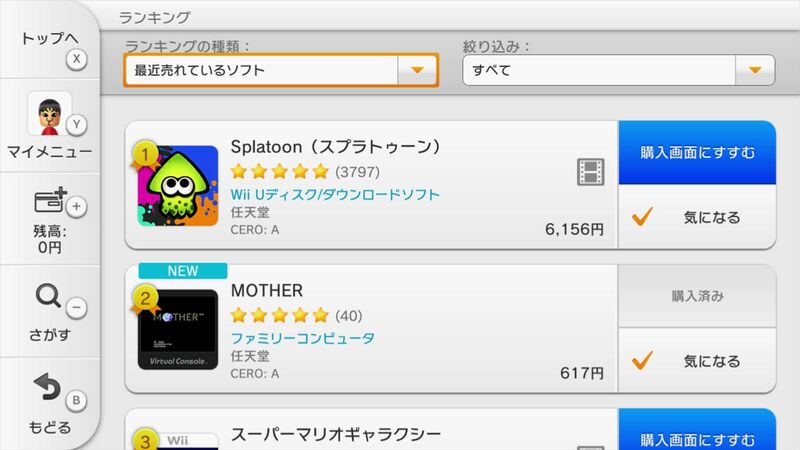 Just proving what we’ve known all along: that the Mother series would do very well if given a chance in America! Operation EarthBound Forever(2016) is it MOTHER 3 GBA VC? MOTHER 3 officially in the pipeline now, hopefully. I think the public has proven themselves at every opportunity provided by Nintendo. Everyone’s forgetting one very important difference. The NES game is $7. It’s still heartening to see it succeed so well though. I keep hearing people call Splatoon the “first new IP in over a decade”. I’m… pretty sure there’s a selective memory going on there. I’ve got Steel Diver, Harmoknight, the Pushmo series, the Dillon western series, and a number I’m sure I forgot. I may be willing to concede that Splatoon is the first console-exclusive IP in a long time, but well, I love my 3DS. Hmm, actually I’m curious about when they’ll bring Earthbound Beginnings (Imma calling it EBB for short, I like the flow of it) to 3DS. 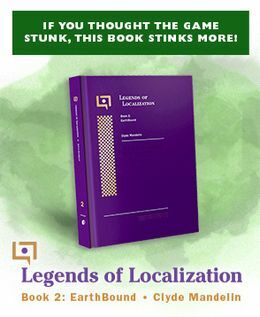 Their emulator ought to handle it just fine. No big rush on that one (I treat this most recent development like a priceless fabrige egg, any criticism might break it), but it’d be nice. Yeah, you are right and I agree. Those are IPs, but not on home consoles. Semantics are apparently for stupid people. Splatoon is fine…wondering when Mario paint ball will come out? I would buy it if I owned a Wii U.
I think the reason it’s #2 in Japan is because it was never released outside Japan, and so many people in Japan probably still have copies of MOTHER, so they can play it like they used to without Wii U.
EarthBound 2 hack the boundening is just a scam.